Yesterday, I took a step to help people find older posts as we move on with our journey. I’m going to be using the hashtag #365GN on social media with my posted reviews. I started this with post five, so from here on out, this will be one way in which you will be able to find my reviews a bit easier. 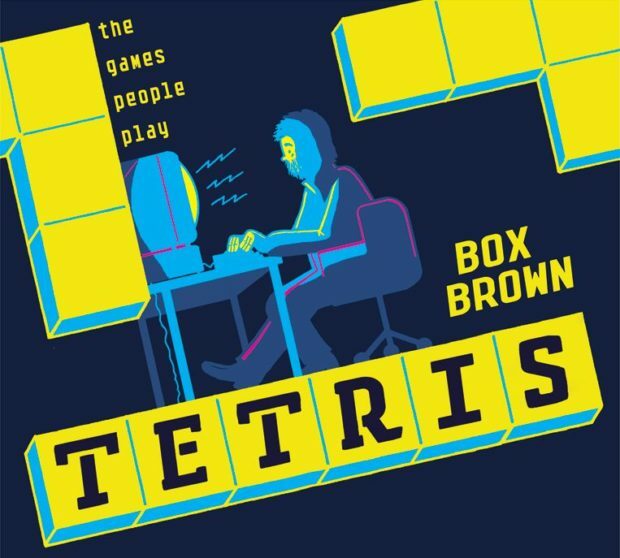 Tetris: The Games People Play came to me, yet again, by recommendation, and as you might guess, it is a graphic novel about the video game Tetris. Really? You might ask. Does it personify the pieces like that amazing Emoji Movie?! First, don’t call that movie amazing, and no, it’s not like that. It’s a work of non-fiction about the creation, development, and distribution of the ridiculously successful game. Published in a monochromatic yellow, this book, while not a ton of info on many of the 253 pages, is dense. That’s where my 13+ rating comes from. Can a ten-year-old read this book? Sure, I guess, but I feel that the amount of information presented is intended for an older audience. The book spans over thirty years, and in the storytelling, the reader gets introduced to every single major contributor that put in work to get this iconic game to the public. That’s a lot of people and a lot of places that these people came from. It’s engaging. Highly interesting to the right readers. This is one of those books that I felt a sense of accomplishment after finishing because I learned a lot about this moment in gaming history. I’d also like to say that First Second Books has some big hits, they love working with educators, and I will be featuring them a bunch. You can check them out here.